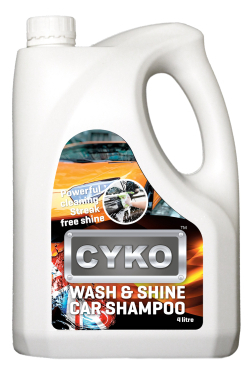 CYKO™ Wash & Shine Car Shampoo cuts through dirt, diesel grease, road tar, bugs and general road grime and rinses off to a streak free finish you can buff with a gleaming shine with a soft cloth. CYKO™ Wash & Shine Car Shampoo works equally well on wheels and windows, bumpers and paintwork, our formula makes cleaning your car like a walk in the park. CYKO™ Wash & Shine Car Shampoo is tough on grime and the causes of grime, yet gentle on the environment & completely biodegradable. CYKO™ products are not tested on animals because frankly that would be cruel and CYKO™ is anything but cruel. Besides whoever heard of a shiny rabbit? Dilute at 1:20 in warm water. Apply generously with a sponge or a soft cloth to remove dirt and traffic film. Rinse with fresh water and if required, dry with chamois. P305 + 338 + 351: IF IN EYES: Rinse cautiously with water for several minutes. Remove contact lens, if present and easy to do. Continue rinsing.